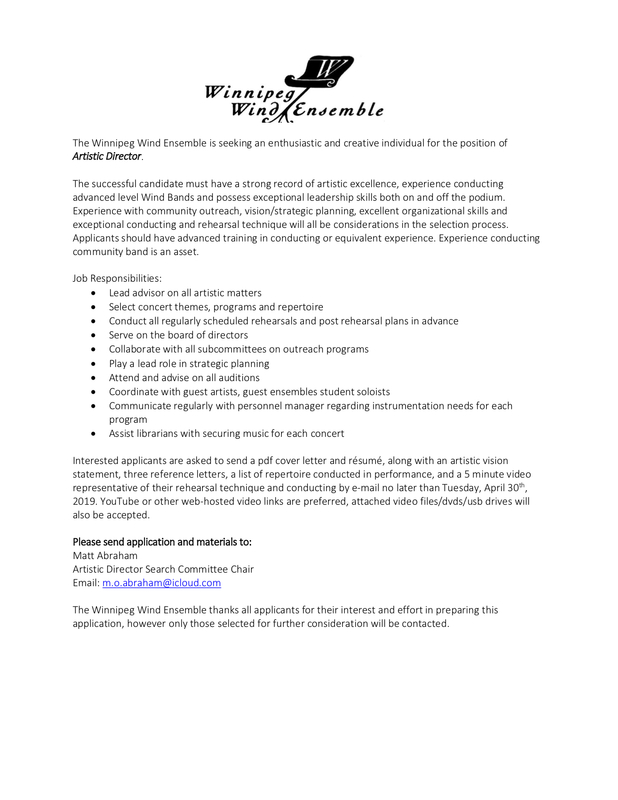 The Winnipeg Youth Wind Ensemble is pleased to announce the appointment of a new Artistic Director starting in the 2019/2020 season, Michelle Styles! Styles is currently teaching Music and Band at École Sage Creek School in Louis Riel School Division. We are excited to add her to the Winnipeg Wind Ensemble team. The Winnipeg Youth Wind Ensemble is an initiative that began in the 2016/2017 concert season! This ensemble is an educative, performance-based wind ensemble geared towards students in grade 8-10. Students who play brass, woodwind, percussion, or double-bass are invited to audition to be a part of this new and exciting endeavour! If you would like an opportunity to play your instrument in a highly enriching rehearsal and performance environment with a group of like-minded musicians, then this band is for you. Membership will include 25 rehearsals and three performances, including an opportunity to perform with the Winnipeg Wind Ensemble. The Winnipeg Youth Wind Ensemble is currently under the artistic direction of Ross Brownlee. Click here to learn about this dynamic and inspiring educator! Learn more about the Winnipeg Youth Wind Ensemble here. Rehearsals for the 2017/2018 WYWE Season will be on Tuesday evenings from 7:00 – 9:00 PM at Westgate Mennonite Collegiate. There is no fee to audition, but a membership fee will be charged for the year. Please contact us for more details or to schedule an audition. Copyright © 2019 Winnipeg Wind Ensemble. Website design by Steve Melnyk Design Studio.